HEAVILY armed police have ended a tense two hour stand-off outside NSW Parliament after a man threatened to harm himself and others. The man pulled up in a white Chrysler just before lunchtime and handed a note to police, witnesses said. 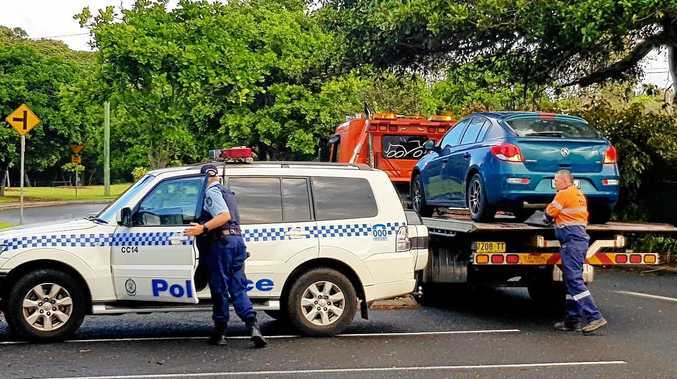 But about 2pm NSW time, heavily armed police moved in and broke into the car to get the man out. Fire extinguishers were quickly deployed. The actions of about eight to 10 police officers were applauded by the crowd who had gathered in Macquarie Street. The Sydney street had been in lockdown since the drama unfolded. The extraordinary scenes of the police moving in was broadcast live on television. Earlier, a Riot Squad van was outside Parliament with police donning protective shields and gear. Onlookers were being told by police to move back. It was reported on social media that the car may contain explosives. There were later reports that the man had threatened to set himself alight. A police negotiator or counsellor had been seen talking with the man who was sitting in his car. Members of Parliament and staff were told they are not allowed to enter or leave the building. News Corp reported that NSW Premier Barry O'Farrell and Treasurer Mike Baird left the building under instructions from police by 12.40pm (NSW time). But Mr O'Farrell later tweeted from his office that he had remained within Parliament.